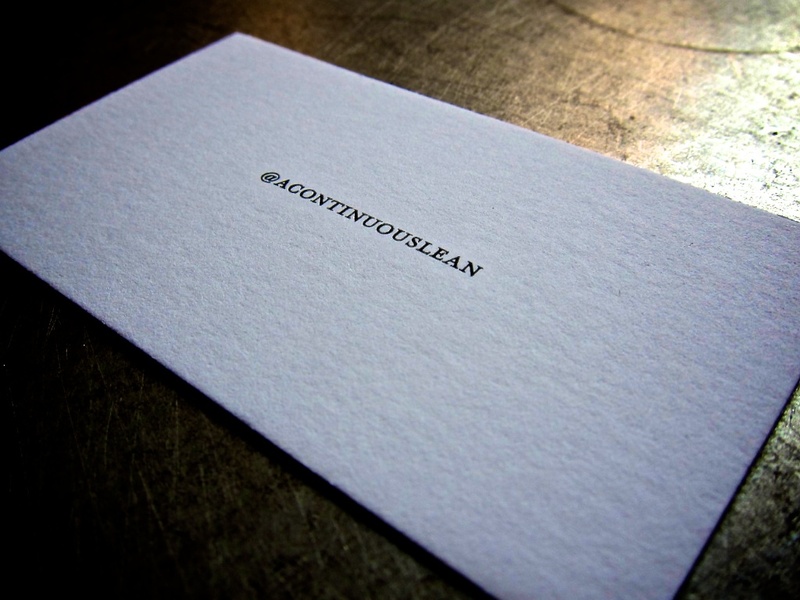 ACL & Co. x Terrapin Stationers | Classing Up Twitter | A Continuous Lean. The worst part about calling cards is the potential for people to actually call you. Because let’s be honest, the only time you want to see that phone number deployed is to a new lady friend. Even with that limited use we stand behind everything calling cards stand for: class, tradition, quality and of course, simplicity. 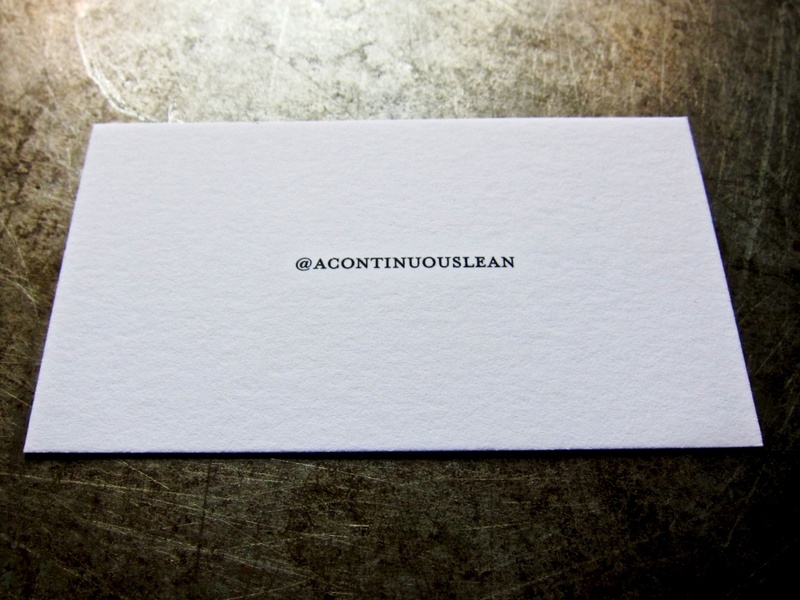 With that in mind, we here at ACL teamed up with Ted Harrington and Terrapin Stationers to create an engraved Twitter calling card; finally classing up that age old “follow me on Twitter” conversation. We loved the idea of mixing such a traditional thing with something as frivolous as Twitter. I will be copy this, and will be placing an order with my printer first thing Monday morning. It would be better if you get engraved versions from Terrapin, but copying is A-okay. a very good idea. should i copy it, too ? I like everything about this. Great idea! Calling cards are just yet another plank in the bridge that leads us to basically becoming 19th Century cosplayers. But, I’m still extremely jealous. I’m still forced to make my calling cards out of Post-It notes. Looks like some seriously beefy card stock right there. Very nice. Navy or black lettering? Terrapin does great work! As a graphics-minded guy, I’m not wild about all-caps, especially with multiple words. It just takes effort to read, and God help those with a double-entendre in the making. I may have to dig out my plates again. Gavitt & Co, our 19th Century engraver in Albany finally slid under the waves, but Crains is just over the hill in Dalton, MA. I spose I’d stick with brown on ivory, as is my stationery. But, in this age, I’ll probably use my corporate name rather than the house’s. Thx for the inspiration for rejuvenation. i 1) love it, and 2) will be on the phone (or email) with these cats on monday getting a parcel of these made with my logo. Paper is king and if you want the best take a look at a company that is an 80+ year old, all made in America, by hand, Mrs. John L. Strong fine stationery. Seven US presidents and the Duke of Windsor must know something. Mrs John L. Strong is a wonderful Company couldn’t agree more. I do like the hand graving though – and made in the USA. Damn it, I was scooped by JRS. FYI, thanks for the link, just bought two nice card memo sets from these guys with amazing fly fishing fly’s on them on Etsy. Pic of the copper plate? Chris, here’s a copper engraving plate. Thanks for the plate photo Michael. That is so fresh. I love it plus the encouragement to get them from Terrapin Stationers. What type of paper was used here? Seems pretty thick too!